Dorsal view of specimen in its natural habitat. oedipus: named for Oedipus, a mythic Theban king who tore out his eyes. Type locality is ‘Tham Nam Lang (Nam Lang Cave), 19°31’N, 98°09’E, Mae Hong Son Province, Thailand’, and this species is restricted to a series of caves in the Pang Mapha karst formation, Mae Hong Son province, northwestern Thailand. They’re located 155 and 370 metres above river level, however, discharge into opposite shores of the Nam Lang and flow above ground for a distance before doing so, the latter limiting subterranean flow between them and thus contact between the two populations of fish. The other three populations are also genetically-isolated, and analyses by Borowsky and Mertz (2005) revealed all five to be divergent from one another, forming three distinct groups. The Nam Lang, Mae Lana and Ban Louk Kow Larm caves comprise one, while Tham Nong Pha Cham and Tham Huet are both unique. These differences were not considered sufficient to designate them separate species, however, and it remains unresolved whether they derived from separate incidents of an ancestor invading caves, or from a single such event with subsequent isolation. Inhabits flowing subterranean streams which are often interrupted by cascades. Said to feed on aquatic microorganisms and organic detritus. Males may possess a thickened second pectoral-fin ray (Kottelat, 1988). This species’ conservation status clearly precludes its suitability as an aquarium fish so it’s included here for reasons of interest only. It’s protected by Thai national law and illegal to remove from its habitat. Species exhibiting morphological, physiological or behavioral adaptations to a subterranean existence are often referred to as troglomorphic. In S. oedipus the eyes are reduced to vestigial pits beneath the skin and the body is unpigmented. 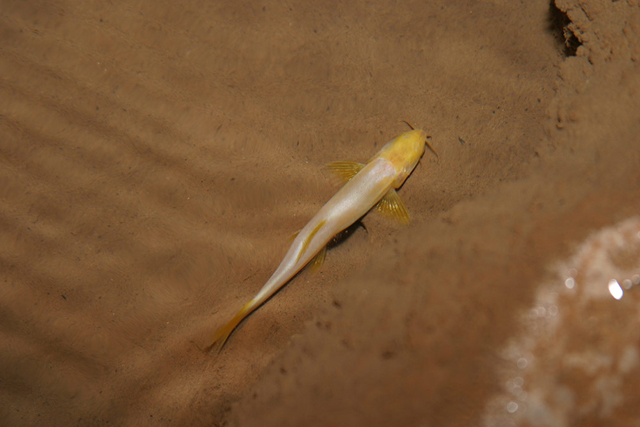 Troglomorphic fishes have been described from several familes with at least four other blind loach species endemic to Thailand: Schistura deansmarti, S. oedipus , Nemacheilus troglocataractus ( all Nemacheilidae) and Cryptotora thamicola (Balitoridae). Troglomorphic fish species may also be referred to as hypogean or troglobitic, and are often characterised by certain aspects of their ecology including low population size, restricted distribution, low tolerance to environmental degradation, precocial life cycle traits, a lack of environmental cues, restricted space and frequent scarcity of food (Trajano, 2001). They’ve been found in all continents except Europe with the majority representatives of the orders Cypriniformes and Siluriformes. Schistura is the most species-rich genus among nemacheilid loaches with some 190 members and it continues to grow with over 100 having been described since 1990. It may represent a polyphyletic lineage and is often arranged into a number of loosely-defined species ‘groups’, some of which are quite dissimilar to one another. Most inhabit flowing streams or areas close to waterfalls where there naturally exist high concentrations of dissolved oxygen, and a handful are troglobytic, i.e., cave-dwelling, in existence. The latter have reduced pigmentation and are completely blind in many cases. Two species of cavefishes from northern Thailand in the genera Nemacheilus and Homaloptera (Osteichthyes: Homalopteridae). Genetic differentiation among populations of the cave fish Schistura oedipus (Cypriniformes: Balitoridae).